If anything good came out during the recent increases of fuel oil prices, it is that once again there is a great interest in alternative sources of energy and solar being one of them. Even when pump prices have decreased again like nothing we have seen before, the uproar created and the pain it did to business will have a good chance of sticking. The desire for alternative sources of energy is on the forefront and may stay there for good – as it should. Extracting oil from crops is a good idea; the downside is that food supplies could be dramatically reduced. Wind power is another excellent source except for the many buts that wind power generation has. 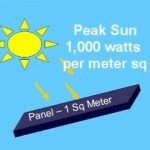 If installation cost is the main objection to solar power generation that should be the least of our worries. The installation of solar panels is until today, considered a specialized job. Like any commodity in the market, when the demand is high but the supply is limited, the cost increase. As more and more homes clamor for alternative sources of energy, better technology and more labor is drawn to the job so that market forces can take place and result into much lowered prices. This though is still in the future. Today the reality is the instability and the unpredictability of pump prices. But even if it did provide stable and predictable price movement, solar energy is free and it is inexhaustible. Homes that are solar powered are getting back dividends in terms of higher appraisal for their property, confidence in not being surprised by power shortage and outage, not being dependent on the fluctuation of power prices and the definite advantage of having provided a better environmental solution. •Through Flat Plate Collectors – employ a system of pipes. The water inside the pipes becomes heated and is ideal for heating purposes like schools, homes, swimming pools, offices etc. •Through Photovoltaic Cells – These are the most common type for collecting solar energy characterized by solar panels installed in rooftops and other flat surfaces where there is a good coverage of sun, converting the power collected into electricity. Unlike any products, whether refined or manufactured, the processing of solar energy does not need additional costs of energy to power it up. It is energy generated by its self. Except maybe for regular inspection and replacement of parts (when it employs a mechanical device), the tapping of solar energy is virtually maintenance free. Once installed, it could be used for as long as needed for the amount of energy, (depending on the capacity of the unit), which the owner requires. how a user can be aware of it. Therefore that’s why this piece of writing is perfect. Thanks! , wind power is also effectively used in hot ctmlaies where a lot of wind is available so either ones are a good solution.Solar heating through the use of flat panels is currently the most cost effective way of using solar power as sustainable and renewable energy source. Though in colder ctmlaies it needs to be combined with a conventional heating system for the winter months when little sunlight is available. But despite that it still pays for itself within a few years in energy savings in northern countries. I simply want to tell you that I am new to blogging and site-building and absolutely liked you’re web blog. Likely I’m likely to bookmark your blog post . You actually come with incredible articles and reviews. Regards for sharing your web-site.